What a great day!!! It is so warm outside. OK, not warm like the desert, but I'll take the high 60 degrees any day!!! 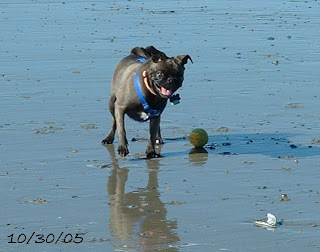 I went to the beach this morning with Gillie after my errands. I only take one dog when I am by myself. If Mark or Norma can go with me, I can bring all three!! I need that extra pair of hands (to carry the poop bags!) and eyes (to catch my runaway Lucy!). It was so nice, breezy and quiet, just how I like the beach. There was me, a few retired couples and a group of "Goth" kids obviously skipping school. Yah, I would have skipped school today too! We had a great walk of about three miles. Which is good because I am meeting a friend tonight for dinner and now I will not feel so guilty eating. Here is a picture taken awhile ago (quite awhile by the date!) of Gillie on the beach. Who says dogs don't smile? That looks like a grin to me! OK, time to vacuum up all the beach sand before it is tracked all over the house!!!! ok, I watch surreal life. Hi Kathy!!! Most people have, but there are a few who don't want to admit it!! Ha ha!!! Who got kicvked off this week? My VH1 channel doesn't work!! ARGH!! !